Figure 1. Top: Overhead view of a grid, showing the mesh. Bottom: Side view of a carbon coated grid showing the relative position of the carbon film to the grid and sample. Most biological EM work is done on small (several millimeters) copper discs called grids cast with a fine mesh. This mesh can vary a lot depending on the intended application, but is usually about 15 squares per millimeter (400 squares per inch). On top of this grid, a thin layer of carbon is deposited by evaporating carbon graphite onto it. It is on this thin carbon film that the sample will then rest so that it can be examined in the microscope (Figure 1). Carbon is generally a hydrophobic substance (that is, it repels water), and if a drop of water is placed on it, the water will want to minimize it's contact with the carbon. To make the surface more accessible to water and the suspended sample, the carbon needs to be made hydrophilic. This is accomplished by glow discharging. In glow discharging, the carbon coated grids are placed inside a partly evacuated chamber connected to a power supply. When high voltage is applied between the cathode and anode at each end of the chamber, the electron potential ionizes the gas within the chamber. These negatively charged ions then deposit on the carbon, giving the carbon film an overall hydrophilic (water attracting) surface. After a small drop of the sample is placed on the hydrophilic grid, it needs to be stained so that the sample can be easily differentiated from the background. Transmission electron microscopy uses a high energy electron beam to bombard the sample. Depending on the amount of energy that was absorbed by the sample, the intensity of the beam that hits the viewing screen varies, and an image is made (remember that contrast arises from the beam interacting with the sample). However, carbon, oxygen, nitrogen, and hydrogen, the main components of biological molecules, are not very dense, and the amount of electrons they absorb is minimal compared to the intensity of the electron beam. Therefore, for normal EM viewing, samples are stained with a heavy metal salt that readily absorbs electrons. This is usually lead, tungsten, molybdenum, vanadium, or depleted uranium. After staining, the sample is blotted, air dried and ready to be examined in the microscope. Staining with these heavy atoms is called "negative staining" because one sees not the object itself, but rather an area empty of stain surrounded by stain. This area is empty of stain because the sample material (protein for example) prevents it from depositing onto the carbon layer. Good contrast is achieved when the stain completely surrounds the specimen and neighboring area. Figure 2. Top: Overheard image of a homemade holey grid. Bottom: Image of a manufactured holey grid. Although the carbon film is very thin and usually presents no big problem in obscuring a sample, for high resolution studies of unstained biological macromolecules any interference on the beam can be problematic. 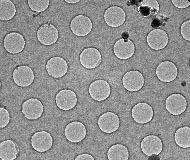 For high resolution studies, holey grids are used in conjunction with freeze-sample (cryo) electron microscopy. Similar to normal carbon coated grids, holey grids are covered with a fine layer of carbon. 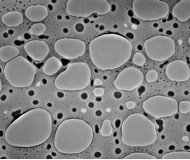 However, as part of the preparation process, the carbon film is deposited in such a way that there are holes of a desired size in the carbon (Figure 2). One of the purposes of these holes is to eliminate any absorption and scattering of the electron beam by the carbon film, which will generate noise and obstruct the signal. Because cryo EM does not use staining, any elimination of background noise is desireable. The holes also allow for "pockets" of solvent to form. Within these pockets, the specimen remains fully hydrated, even when the sample has been frozen.